POS Global offers a variety of Payment Terminals. Browse our selections and feel free to contact us for more information or to see how our products can benefit your company. Plan on buying something else? Don't forget to purchase Printers. 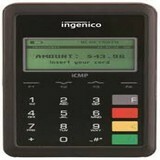 ISMP4 Companion is PCI v4.0 certified to accept payments through EMV chip & PIN, magstripe, and contactless reader.